Lisa from Talk Functions shares how she planned a carefree day for Catarina and Stephan. Catarina & Stephan had a beautiful and elegant celebration of true love at Nooitgedacht which is a 300 year old family run Wine Estate situated near the picturesque town of Stellenbosch. Catarina the perfectionist with her extrovert and creative personality and Stephan with his laid back approach were amazing to work with and just complimented each other in planning different aspects of their special day. They do say opposites attract! I worked closely with Catarina when it came to the design aspect of the wedding. Her creative personality really inspired me to push the envelope in finding the right décor elements for her day. Her theme was Baroque inspired with a modern twist. Her bold choice of colours were deep purples and vibrant greens. I hunted high and low for interesting containers and worked closely with the florist to finalise the concept. I focused on bringing in lots of different textures and patterns through the stationery and linen and containers. The tables were abundantly decorated with flowers and lots of candles. We hung chandeliers which is associated with luxurious baroque décor. A Chapel-like setting for the ceremony was high on the priority list. The Old Wine Cellar was the perfect setting. With its dilapidated physical features of plaster peeling off the walls and exposed brickwork this setting just oozed its own distinctive character. We brought the Baroque period into the ceremony area. 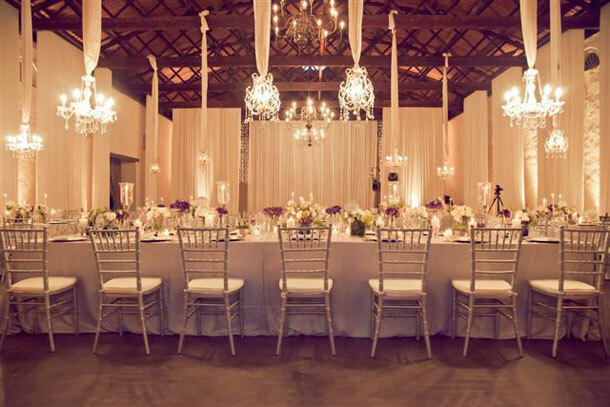 The large glass dome-like chandeliers hanging from the rafters added a bit of drama to the scene. We took the opportunity to use as many candles as possible. Catarina arrived at the Chapel sitting in the side-car of the Vintage motorbike. It was quite a nip and tuck session getting her dress inside that small seating compartment. After the ceremony the bridal couple had loads of fun taking it for a spin around the Estate with photographer in tow on the run capturing these two hooligans! Delectable canapés were served outside under the lovely ancient oak trees. The Marimba Band indulged the guests with the rhythms and sounds of Africa. After canapés guests were ushered to the beautifully decorated reception venue where they were treated to a scrumptious buffet dinner. On the DJ’s music list was a flavour of Portuguese, Afrikaans and contemporary music to satisfy both families. Catarina’s folks insisted I join in for the dancing since I was literally part of the family now. There was no way out of this one. I was literally dragged onto the dance floor. I had a long wedding planning journey with Catarina and Stephan. They had a short set-back with their wedding plans due to a tragic event taking place just hours before their wedding. The courage of these two individuals was amazing. Nothing was going to stop them from getting married. The wedding was postponed but we all hung in there and found a new date and new venue and new courage to continue with our journey forward. The journey was emotional at times but when their Wedding Day eventually arrived I could feel the bond between this very special couple was stronger than ever. The speeches on the evening pulled at the heart strings at times and I just knew that the family ties in both families were phenomenal. Everytime Catarina wanted to shed a tear during a speech her sister would put on one of those funny plastic masks with the big nose, glasses, eyebrows and moustache that you would find in a Chinese Wholesale Store. Between tears there were fits of laughter. I was sad to say goodbye when our journey ended after almost 2 years but life goes on and I have the next wedding to plan. I was truly blessed to work with Catarina & Stephan. They will always have a special place in my heart. Du Wayne captured all the details of this wonderful wedding perfectly.